Street style has come a long way from a small group of bloggers surreptitiously snapping on the sidelines of fashion. What started as a few candid snaps is today a million-dollar business that sees style-hungry men worldwide dissecting what fashion show attendees are wearing as much as what the models on the runway are. And for the most part that’s good. What’s not to like about seeing menswear’s insiders flexing their style, setting trends and at the same time giving the rest of us a blueprint for how to broach them ourselves? Well, nothing really, apart from the fact that a lot of what’s shot isn’t worth its space on a memory card. Forget the try-hards, it’s time to honour the men sidestepping outlandish (and frankly bad) style for the sake of it. The anti-peacocks. The men confident enough in their own skin to not bother about getting dressed with the sole purpose of getting snapped. Which, of course, makes their outfits all the more lens-worthy. Prior to becoming one of photographer Scott Schuman’s subjects on OG street style blog The Sartorialist, fashion entrepreneur Alessandro Squarzi was little-known outside of his native Italy. Thankfully, that chance passing between the two has spawned a steady and impressive documentation of Squarzi’s wardrobe ever since. Flitting between elegant comfort and Pitti peacockery without so much as breaking a sweat, this man about Milan doesn’t shy away from trending pieces but always wears them in an effortless way. And if you ever needed a visual representation of why every man needs a strong outerwear game, Squarzi provides it. No street style list worth its salt would be complete without arguably the world’s most-watched male supermodel. David Gandy may have gotten his start on breakfast TV, but he’s since gone on to front campaigns for the likes of Dolce & Gabbana, Banana Republic and Marks & Spencer. Fittingly for one of London Fashion Week Men’s most prominent ambassadors, Gandy’s wardrobe regularly leans heavily on British tailoring. But it’s not the just timeless stuff – the checked three-pieces and elegant jacket-T-shirt-trouser get-ups – that Billericay’s finest has down pat. He’s also a master of casual tonal looks, too. Another reason to secretly hate him. Even if you’re not familiar with Eric Rutherford by name, you’ll almost certainly have come across shots of his perfectly coiffed silver hair and ultra-sharp wardrobe, which effectively amount to a definitive handbook on how clothes should fit. One of those maddeningly versatile types who can pull off just about anything, no two of the American model’s outfits are ever the same, whether it involves cutting a rug in a roll neck or making chinos look peak Riviera. Rutherford is walking proof that men in their middle age can run rings round the young guns in the style stakes. Still don’t get the concept of sprezzatura? Ask Frank Gallucci. The native Calabrian has been instrumental in putting Pitti Uomo on the street style map, with his signature mash-up of Italian tailoring and smart-casual shirt-trouser combos fasting becoming one of the main attractions of the bi-annual menswear event. As a former model, Gallucci’s lucky draw in the genes department certainly help make his moves in the wardrobe department stick, but it’s the way he makes statement pieces look so easy that earns him a place in our hall of fame. Flanking David Gandy is no mean feat, but London Fashion Week Men’s fixture Joe Ottaway takes it all in his immaculately suited stride. As a personal stylist, Ottaway has been the brains behind David Gandy’s killer wardrobe, as well as countless other A-list musicians, actors and sportsmen, but his own sartorial line-up is equally impressive. A sharp mix of bespoke Savile Row suiting and old-school Hollywood, his style epitomises the modern gentleman, without skewing too dandy. Not bad for an Essex boy. Johannes Huebl is one half of the world’s most genetically blessed couples, so he could pretty much wear the most uninspiring outfit imaginable and still scrub up well. Huebl’s not one for resting on his genetic laurels, though, and makes sure he’s always out repping Club Menswear better than pretty much anyone we can think of. What you won’t get here is daring or cutting-edge. What you will get is blueprint after blueprint for outfits that will look just as good IRL as they do sauntering past a battalion of street style photographers. Plus the occasional shot featuring Olivia Palermo. So it’s a win-win. For a man that grew up in the Arizona desert, Bruce Pask knows layering. Currently men’s fashion director at legendary New York store Bergdorf Goodman, Pask honed his eye with stints at several major publications and as a stylist. But it’s his uncanny ability to wear two jackets at once that has seen him skyrocket through the street style ranks. Pask is perhaps best-known for almost single-handedly popularising the outerwear layering trend. Whether it’s a denim jacket and a wool overcoat, a gilet and a topcoat, or a blazer and a parka, this stalwart of the street nails his silhouette every single time. The Germany-based Aussie’s strength lies in his ability to splice rock-inspired and refined styles: shades and fully-inked sleeves worn with a three-piece suit; or a white vest and smart black high-waisted trousers. The kind of looks that – when surrounded by overly preened, predictable ensembles – sets street alight with punky spark. The only thing more impressive than Milan Vukmirovic’s CV – he co-founded Parisian concept store Colette, worked alongside Tom Ford as design director at Gucci and is the editor-in-chief of international style magazine L’Officiel Hommes – is his own personal brand of menswear magic. The key? An unwillingness to be pigeonholed. Vukmirovic’s mastery of diverse genres is unrivalled. Statement outerwear? He’s done that. Neutral toned tailoring with razor-sharp cuts? Easy. 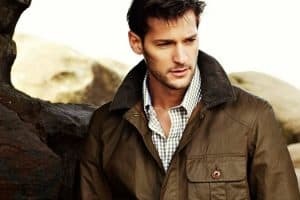 Rugged and updated workwear classics? A dab hand, too. AKA ‘The Woost’, ‘The Woostgod’, one of the best-dressed men of all time. At 56 years of age, the fashion exec-turned-menswear designer pushes the boundaries of style further than guys half his age – a fact his 730k Instagram followers and work with Thom Browne, Ralph Lauren and Calvin Klein are a testament to. You could say it was Wooster that made #menswear as we know it. Before him – his shorts suits, liberal patterns and iconic handlebar moustache – we had little in the way of inspirational show regulars. Or, at least, none who courted Scott Schuman’s and Tommy Ton’s cameras so well. Watch. Learn. Then buy up every collaboration he comes out with. Sure, models get paid to look good, but far from being just another mannequin with a pulse, Oliver Cheshire is just as much menswear substance as he is style. When he’s not inside on the runway, Cheshire manages to steal the limelight outside the shows with his impeccably put-together looks, which run the gamut from dressed-down tailoring to streetwear made smart. If ever there’s an up-and-coming trend that we’re ambivalent about, all it usually takes is Cheshire wearing it to tip us over to fanboy territory. Eclectic is a word that gets bandied around way too often when it comes to men’s style, but for model and champion of British-made menswear Richard Biedul, it’s a bang-on-the-money description. Recognisable not only thanks to his rakish looks and equally well-dressed miniature dachshund Vinnie, Biedul’s style genre-hops from 1970s-style tailoring and colourful corduroy to layer after layer of swoonsome heritage fabric. Despite being a regular fixture on the circuit, we’re rarely not pleasantly surprised by what Biedul’s thrown on his back.